Last week Spouse and I worked on our vegetable garden. By that I mean we bought plants and talked about planting them. 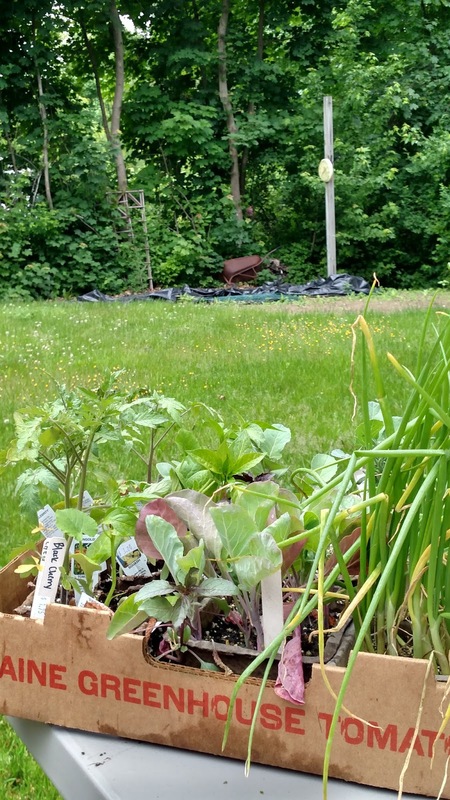 The small patch of yard dedicated to the garden each year remains half covered with black tarp and will not be seeing any planting until it is – well, tilled. In the meantime, we had taken a drive in the area of a farm that used to send a truck of fresh produce to the hospital where he works. Employees were able to get a great deal by buying shares ahead of time, so we took advantage of it. Last year the bus that carried all those goodies into town met its demise and was not replaced. It was the perfect excuse to take a leisurely drive into the country (it may have been more leisurely if we hadn’t gotten temporarily lost) and stop at the farm stand. The good news was that Spouse still had shares to put toward our purchase. A lot of shares. There really is no way this could be bad news, except that it meant we could pretend everything was “free” since he paid for the shares over a year ago. What happens when you can pretend it’s not costing you anything? Impulse buying. In this case that would result in impulse planting. We started with an empty box, wisely provided by the farm, and immediately began filling it with vegetable plants of every variety. Spouse headed straight for the peppers while I perused the herbs. We picked up onions, tomatoes, broccoli, Brussels sprouts and lettuce to start. After getting my fix by sniffing the rosemary, I chose that and a couple of other herbs that I believe I’ll actually use this year. My sister-in-law makes really good pesto with fresh basil from her garden. I’m going to tweak her already amazing recipe with a tad more garlic, like any true Italian cook would do. By the way, the Italian cooking rule I was brought up is this: a recipe calls for one garlic clove; you add no less than three. Since Second Born has decided that she now likes all sorts of vegetables (which she discovered while living in another country last year instead of at our dinner table where I tried to disguise vegetables for the last 20 years as macaroni and cheese), my plan is to “let” her help tend to the garden. She doesn’t know it yet, so if you see her please don’t mention it. I want to spring it on her – I mean – surprise her at the right time, you know, like maybe right after I’ve made her favorite meal or filled her SUV's gas tank. Meanwhile, the plants are temporarily residing in our backyard, gazing longingly from their little plastic pods over to the spacious stretch of ground that is meant to be their home. It isn’t unusual for us to procrastinate in our planting (as we do with many things). I recall one Fourth of July weekend we spent sticking plants into the ground. The crops weren’t the greatest that year, but even that late in the season there were days when my kitchen looked Hannaford’s produce department had exploded in it. We’re not done with the plant purchases yet. Spouse always has grand ideas for his pepper plants. They must include sweet, hot, hotter and fireball. Then there are the tomato plants, which somehow always seem to multiply like rabbits before we get them in the ground. You’ve got your Big Boy, your Bigger Boy, your Oh Boy – it never ends. Garden prep is a lot of time consuming work, but now that we went hog wild with our plant purchases I know we need to invest the time. We may or may not get to the planting this weekend. But I can guarantee we’ll think about it. Vertical vegetables gardens aren't a replacement ideal but every now and then they're mistaken with a living wall. Since each living walls and vertical vegetable gardens may be used for manufacturing vegetables and fruits, living walls square measure a lot of targeted on beauty than production of food.